Joseph Rudyard Kipling (December 30, 1865 – January 18, 1936) was a British author and poet, born in India, who was best known in his own time as a poet who wrote in a neat, clean style that made his poetry readily accessible at a time when most English poetry was turning towards dense symbolism and complexity. Kipling's fame as a poet was so great during his own time that he became the first Englishman to earn the Nobel Prize for Literature. 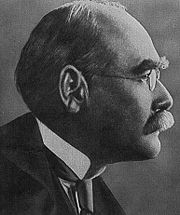 Kipling's reputation as a poet, however, has suffered considerably since his death due in large part to his political views on imperialism and his racist attitudes towards minorities. Kipling, of course, was a man of his times, and his views were rather common for an Englishman at the turn of the twentieth century; nonetheless, Kipling was easily the most vocal and most talented writer of his generation to voice his support for imperialism, and as a result his works have become intimately associated with imperialism itself, so much so that ironically, Kipling has become closely associated with post-colonialist literary theory, which uses critical readings of Kipling's works as the groundwork for a critique of imperialism at large. Despite Kipling's troubled history, he has contributed a number of works which remain popular, and which are largely untarnished by his unfortunate political opinions. Among the most famous of these is his brief poem, "If," which is, arguably, the most widely anthologized poem in the English language. In addition to poetry, Kipling is best known today among general readers for his enduringly popular children's books, most notably, The Jungle Book. Kipling's children's books are written with an innocence and charm lacking from some of his adult works, and they remain some of the most enchanting classics of children's literature. Kipling was born in Bombay, India; the house in which he was born still stands on the campus of the Sir J.J. Institute of Applied Art in Bombay. His father was John Lockwood Kipling, a teacher at the local Jeejeebhoy School of Art, and his mother was Alice Macdonald. The couple had courted at Rudyard Lake in Staffordshire, England, hence Kipling's given name. As a 6-year-old, he and his 3-year-old sister were sent to England and cared for by a woman named Mrs. Holloway. The poor treatment and neglect he experienced until he was rescued from Mrs. Holloway at the age of 12 may have influenced his writing, in particular his sympathy with children. His maternal aunt was married to the artist Edward Burne-Jones, and young Kipling and his sister spent Christmas holidays with the Burne-Joneses in England from the ages of 6 to 12, while his parents remained in India. After a spell at a boarding school, the United Services College, which provided the setting for his schoolboy stories of Stalky & Co., Kipling returned to India in 1882, to Lahore, in modern-day Pakistan, where his parents were then working. He began working as a sub-editor for a small local newspaper, the Civil & Military Gazette, and continued tentative steps into the world of poetry; his first professional sales were in 1883. By the mid-1880s, he was traveling around India as a correspondent for the Allahabad Pioneer. His fiction sales also began to bloom, and he published six short books in 1888. One short story dating from this time is "The Man Who Would Be King," which would later become the basis for a famous film of the same name, starring Michael Caine and Sean Connery. The next year, Kipling began a long journey back to England, going through Burma, China, Japan, and California before crossing the United States and the Atlantic Ocean, and settling in London. His travel account From Sea to Sea and Other Sketches, Letters of Travel, is based upon newspaper articles he wrote at that time. From then on, his fame grew rapidly, and he cemented his reputation as the literary figure most closely associated with the culture of British imperialism. Kipling's sympathies for imperialism—and his racist attitudes towards indigenous peoples—have marred his reputation ever since. His first novel, The Light that Failed, was published in 1890. The most famous of his poems of this time is "The Ballad of East and West"—a ballad about an Indian outlaw, Kamal, who finds himself in a fierce duel with an English Colonel—the poem famously begins, "O East is East and West is West and never the twain shall meet…"
In 1892 Kipling married Caroline Balestier. Caroline's brother Wolcott had been Kipling's friend, but had died of typhoid fever the previous year. They initially met when Wolcott, a publisher, solicited Kipling for the American rights to his books. While the couple was on their honeymoon, Kipling's bank failed. Cashing in their travel tickets only allowed the couple to return as far as Vermont. Kipling and his new bride lived in the United States for the next four years. In Brattleboro, Vermont, they built themselves an enormous house (Kipling referred to it affectionately as his "ship") which still stands on Kipling Road. It was during this time that Kipling turned his hand to writing for children, and he published the works for which he is most fondly remembered today—The Jungle Book and its sequel The Second Jungle Book—in 1894 and 1895. Towards the turn of the century Kipling found himself embroiled in a lawsuit with his brother-in-law. The case weighed heavily on Kipling's mind, and he felt he had to leave Vermont. He and his wife returned to England, and in 1897, he published Captains Courageous. In 1899, Kipling published his novel Stalky & Co., a novel closely based on Kipling's own experiences at school, expressing his patriotic views for the British empire. The novel was quite popular in Kipling's day, and helped to secure his financial independence. In 1898 Kipling began traveling to Africa for winter vacations almost every year. In Africa Kipling met and befriended Cecil Rhodes and began collecting material for another of his children's classics, Just So Stories for Little Children. Kipling published this work, along with his highly acclaimed novel, Kim, in 1902. Kipling's poetry of the time included "Gunga Din" (1892) and "The White Man's Burden" (1899); in the non-fiction realm he also became involved in the debate over the British response to the rise in German naval power, publishing a series of articles collectively-entitled, A Fleet in Being. Kipling was so closely associated with the expansive, confident attitude of late nineteenth century European civilization that it was inevitable that his reputation would suffer in the years during and after World War I. Kipling also knew personal tragedy at the time as his eldest son, John, died in 1915 at the Battle of Loos, after which he wrote, bitterly, "If any question why we died/Tell them, because our fathers lied." In modern-day India, from which he drew much of material, his reputation remains decidedly negative, given the unabashedly imperialist tone of his writings, especially in the years before World War I. His books are conspicuously absent from the English Literature curricula of schools and universities in India, except his children's stories. Very few universities include Kipling on their reading lists, and deliberately so, though many other British writers remain very much in currency. Kipling's writings live on in universities, however, though for highly ironic reasons. Kipling's works are considered essential reading for historians and scholars studying the phenomenon of imperialism, as Kipling is easily the most visible and talented literary figure to have lent his voice to the politics of imperialist Europe. Despite changes in political attitudes, Kipling's poetry continues to be popular with those who see it as "vigorous and adept"—straight forward and clear, during a time when much poetry was tending towards the obscure. Even T. S. Eliot, a very different kind of poet, edited A Choice of Kipling's Verse (1943), although in doing so he commented that "[Kipling] could write poetry on occasions—even if only by accident!" Kipling's stories for adults also remain in print and have garnered high praise from writers as dissimilar as Poul Anderson and Jorge Luis Borges. Nonetheless, Kipling is most highly regarded for his children's books. All links retrieved June 20, 2014. Works by Rudyard Kipling. Project Gutenberg. Kipling's Imperialism by David Cody - a brief entry on The Victorian Web. A Master Of Our Art: Rudyard Kipling and Modern Science Fiction. Rudyard Kipling, by John Palmer, 1915 biography from Project Gutenberg. This page was last modified on 20 June 2014, at 15:42.